You can also eat this pimento cheese cold on plain bread, which is still good too. 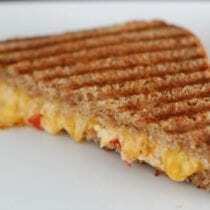 But once we discovered the cooked version (which is like a grilled cheese sandwich with a kick) we were hooked! Just imagine the soft pimento cream cheese mixture melted between two pieces of crispy bread that are grilled to perfection. Need I say more? Blend all ingredients (down to the hot sauce) together very well with a spoon or fork. Can be served cold or continue with directions below for a hot sandwich. Melt 1 – 2 tablespoons of butter in a sauté pan set just slightly higher than medium heat or use a griddle set at 375 degrees F.
Just after the butter has melted (and before it turns brown) rub one side of each piece of bread in the melted butter for full coverage. Remove the buttered bread from the pan and spread a layer of pimento cheese onto the side of the bread that doesn’t have the melted butter on it. Top that with another piece of prepared bread (non-melted butter side facing down) to make a sandwich. Put sandwich back into the pan onto remaining melted butter and cook until golden brown on each side. To make recipe gluten-free, substitute gluten-free bread for whole-wheat bread. I have this recipe too and we love it also. It is great hot or cold as a dip with pita chips also. Yes, it would be great as a dip…thanks for sharing! Just found this blog, what an awesome site! Just curious, have you tried using coconut oil as an alternative to butter? We still use butter from time to time but coconut oil has become our primary cooking oil nowadays. Too many ingredients, plus sugar! (and “spice”? how vague is that?!). Just curious what you recommend…? You know we happen to have this random brand mustard that has been in our fridge for a while. I don’t remember where I bought it, but I know we got it to go with a Polish sausage meal we were making (a long time ago – way before our 100 days!). The brand is Kosciusko and the ingredients are: white distilled vinegar, #1 grade mustard seed, water, salt, spices. So I guess the vague “spices” thing is common in mustard, but it definitely does not have sugar in it or it would say that specifically. I think the Earthfare brand organic mustard is pretty decent with 6 ingredients (one of them being water which my husband says doesn’t really count as an ingredient). Thanks. I saw the Kosciusko brand of mustard at Earthfare and purchased that. (Even though it’s technically a “spicy brown” mustard, and not a Dijon (no white wine in it), it had the best looking list of ingredients). I made this last night, and oh my goodness – so delicious! I love, love pimento cheese – but had to say goodbye to the orange-colored tub of chemical goo – this was a fantastic replacement. Yum! I am so happy to hear of someone else sharing the love of this sandwich! Your bakery should definitely tell you the ingredients! I wouldn’t buy anything from a place that won’t tell you what they put in it. Oh just saw your other comment that you found a Great Harvest…that’s great! We love their honey whole-wheat loaf (5 ingredients and 100% whole-wheat), but you have to be careful because they also offer a lot of options made with white flour and sugar. Good luck! Almost all I can say is, I’m not sure what to really say! 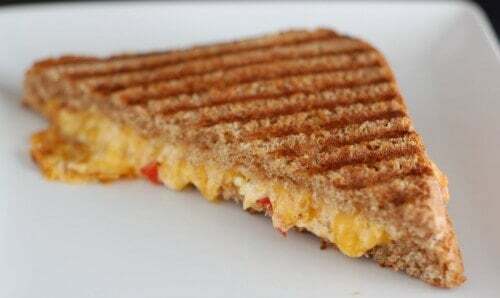 Except needless to say, for the fantastic tips which are shared within this https://www.100daysofrealfood.com/2010/07/26/recipe-grilled-pimento-cheese-sandwich/ blog. I’ll think of a trillion fun methods to read the content on this site. I think I will at last make a move using your tips on those issues I could never have been able to deal with alone. You were so thoughtful to let me be one of those to learn from your handy information. Please recognize how considerably I appreciate it. Disclaimer: I try to eat whole foods but am not at 100% yet. I tried this last night, it was awesome. I am from charlotte (but moved to CA) and loved Penguins Winky dinky dog. So, we used it as a topping to our hot dogs to help with the craving. It was amazing, thank you for posting this! On the first sentence it seems to look like it was valid but if you prove it there is no point of this!! Try the grilled pimento cheese topped with grilled fresh pineapple, too! Try it on raisin bread! Awesome savory combination! This was DELICIOUS!!! I got the honey whole wheat from Great Harvest and had it for lunch. I’ve been using the spread as a dip with pita chips as well. Love it! This is delicious! Can’t wait to make a sammie for my hubby– he’s at work. Tried this last night….We are new to the “real food” concept…Well actually my DH and DD have no idea that we’ve been doing any of these recipes. My husband loves Pemiento Cheese and we have tried a few recipes over the years with little success. I did this one last night and he LOVED IT! He kept commenting on the “kick” it had to it and I said if you don’t like the Kick I could leave out the hot sauce and he said no…that was one of his favorite things about it. We have a new must have in our house! Thank you for your wonderful recipes! update…We ate some last night with some cornbread crackers (I’m sure they aren’t real food!). When I went home at lunch he had a sandwich and then finsihed off the rest on a tortilla shell. I can always tell if he liked it or didn’t by if 2nds are had or not…Yep this one is definately a hit! My tip is to spread a layer of basil pesto on one of the breads and the pimento cheese on the other. Delicious combination! I LOVE pimento and cheese! It is a favorite my grandmother used to make for me. Unfortunately I had to start following the SCD diet and that meant no cream cheese! I modified my grandmother’s recipe to make an SCD legal version. So delicious!! I LOVE it! this makes the best pimento cheese….evah!!! i left out the hot sauce and garlic for the kiddies, and i still managed kill half a package of ak-mak. LOVE IT!! This is fabulous. We made this and ate it on homemade italian herb bread toasted on the stove top. AMAZING! I’ve tried several of your recipes, and all have been really good -but this is the best. I left out the hot sauce to see if my 2 year old would eat it and she did. I love that it has no mayonnaise. I’m not a mayonnaise eater and like the cream cheese taste so much better. I made these sandwiches and your tomato bisque today. They were so fabulous together. Thank you for the excellent recipes! I have tried to find a jar of pimentoes but no luck. I have gone to several groceries stores (whole foods and Trader joes) but when I ask them they look at me strange. I am from Carolina but now live in Michigan. I want to try this recipe. Any thoughts? I just found this recipe. When I went to the grocery store to find the pimientos, I naturally assumed they’d be near the olives. Nope` they were by the beans! Baked beans to be more exact. Weird, but true. Good luck! They might not be obviously labeled “pimentos.” I just made this recipe for the first time, and the peppers I used were just labeled as Spanish style red peppers. This was so good! I mixed everything earlier so all I had to do was put the sandwiches together. Combined with tomato soup-great lunch! This was an awesome sandwich! So glad I found this recipe! My son loves it too! Thanks for all the yummy recipes. This sounds really good! I’ve never had pimentos, I’ was just wondering what kind of liquid they are in? This sounds amazing and I will be trying it this weekend. I just love your recipes and that they have simple and easy to find ingredients. They always come out tasting great too. We love grilled cheese in our family and this was a great change of pace! Mmmm … this is yummy! I’d read about pimento cheese in old Southern cookbooks, but I’ve never tried it. We tried it hot and cold and I think I actually prefer it cold on a piece of whole wheat toast. I used a sprinkle of garlic powder instead of chopped garlic, because I’m pregnant and my stomach is a little sensitive to strong garlic flavors at the moment. My husband suggested a thin slice of tomato on top, which is also delicious, especially sprinkled with salt and pepper. :) Thank you! I am from Texas and have enjoyed store-bought pimento cheese salad all my life. I was delighted to find out that I could make it myself. I made it last weekend and it is good but the garlic is way too much. If I were to make this again, I might try just a little bit of garlic powder instead. I didn’t try it grilled, just cold as this is what I have been used to, but I bet it would be good grilled. This looks wonderful. I’m always in charge of food for trips and I will be using this for our big group trip to the beach in two days! We have picky eaters but with this recipe it should be terrific. Thanks (also Im obsessed with garlic so Im using cloves like recommended). I just made this and it is SOOOOOO good. It totally hit the spot and it took all of five minutes to pull together. I was born and raised in the south so I’ve definitely had my fair share of pimento cheese through the years but I swear this is the best version. I love that there’s no mayonnaise. I’ve never liked that addition in traditional recipes. Thanks for everything you do, Lisa! I found this VERY strong on the garlic. Next time, I think I may make it without garlic altogether. Oh my gosh. I just made this exactly as written and served it with Mary’s gone crackers (black pepper) and it is an awesome combo. I am supposed to be saving it for a snack tomorrow, but I’m not sure it will make it through dinner.